Annotations describe modifications made to or processes performed on an E-Prime data file. The Annotations feature is like an electronic version of the experimenter’s notebook. When an individual value is modified, an annotation is stored with the session of data containing the modified value, and the modified date for the session is updated. All other annotations are stored globally with the data file. The application does not permit deletion of any annotations except through the Undo command under the Edit menu (i.e., to undo the operation resulting in the creation of an annotation). Within E-DataAid, the Annotations dialog may be displayed by using the Display Annotations command under the View menu or the Display Annotations tool button on the toolbar. 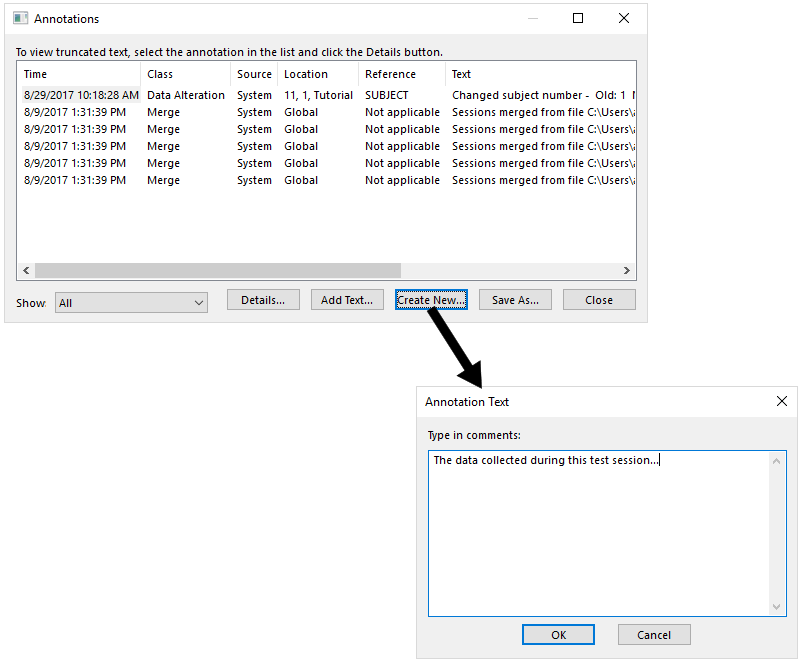 The Annotations dialog contains a list of all of the annotations (session and global) within the data file, and displays specific information concerning each annotation. By default, the annotations are listed chronologically. Data within the Annotations dialog may be sorted by column. Click on the column header to sort the information in ascending or descending order. 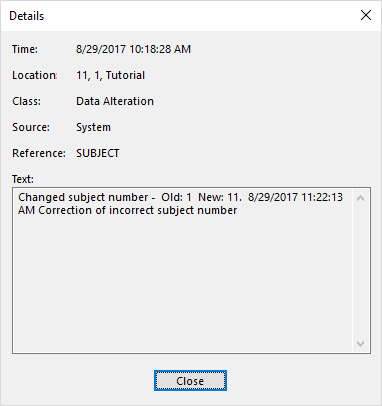 The Time column displays the time and date that the application created the annotation. Any annotation generated by the modification of a variable name or value is classified as a Data Alteration. Any annotation generated by a merge operation is classified as Merge. Any annotation generated in relation to one of E-DataAid’s import functions is assigned the Import class. All annotations not included in one of the other three classes are classified in the Comment class. The Source column displays a value of “USER” if the annotation was created by a user, and displays the value “SYSTEM” otherwise (i.e., for all automatically generated annotations). The Location column displays where the annotation is stored. Annotations that are stored globally with the data file display the value “GLOBAL” in this column. Annotations saved with a particular session of data will indicate the subject number, session number, and experiment name for that session. The Reference column references the value within a session to which this annotation pertains (e.g., if the annotation refers to the session’s experiment name, the reference is EXPNAME). If the annotation is stored globally, the reference is simply “Not applicable.” In the image below, the value of SUBJECT in the reference column indicates an edit made to the SUBJECT attribute (i.e., value changed). The Text column displays the text included in the annotation. Text may be added to an existing annotation using the Display Annotations command under the View menu, or the Display Annotations tool button. The Annotations dialog will be displayed, showing a list of all annotations included in the data file. Text may be added to an existing annotation using the Add Text button at the bottom of the Annotations dialog. Select the annotation to which the text is to be added, and click the Add Text button. The Annotation Text dialog will be displayed allowing the user to enter text. After the desired text has been added, click OK to update the annotation. 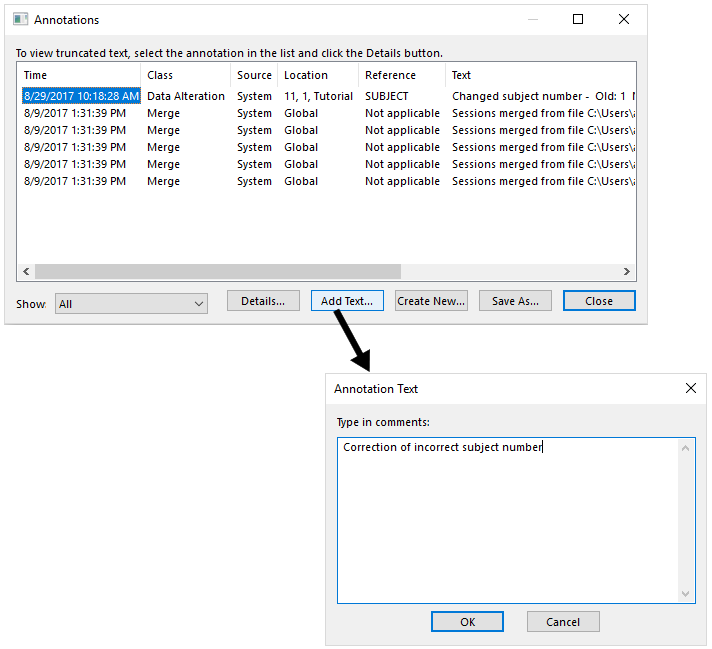 Adding text to an annotation stores the text with the existing annotation, and updates the modified date for both the session and the data file. Any modifications made to a data file automatically generate an annotation describing the operation performed (i.e., renaming a variable, changing a value, etc.). Users may also create their own annotations (e.g., perhaps to make notes, or to mark a particular value). 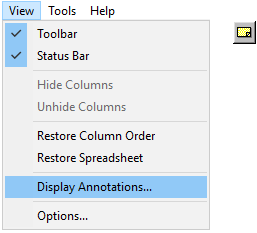 Annotations may be created using the Display Annotations command in the View menu or the Display Annotations tool button. The Annotations dialog will be displayed, showing a list of all annotations included in the data file. New annotations may be created using the Create New button at the bottom of the Annotations dialog. The Create New button displays the Annotation Text dialog that allows the user to enter text. After entering the desired text, click OK to add the annotation to the data file. The creation of a new annotation stores the annotation globally, and updates the file’s modified date. The Details button in the Annotations dialog is used to display the entire text contained within an annotation. If an annotation’s length exceeds the display area, select the annotation in the list, and click the Details button. The Save As button on the Annotations dialog allows the user to save the annotations contained within the file to a text file. The Save As command displays the Save As dialog. 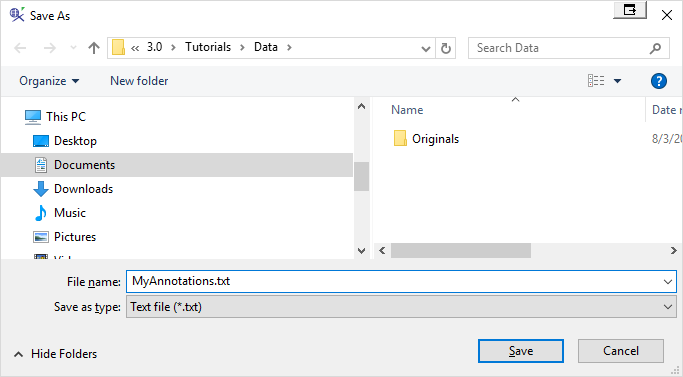 To save the annotations to a text file, enter the name of the file in which to save the annotations in the File name field and click Save.